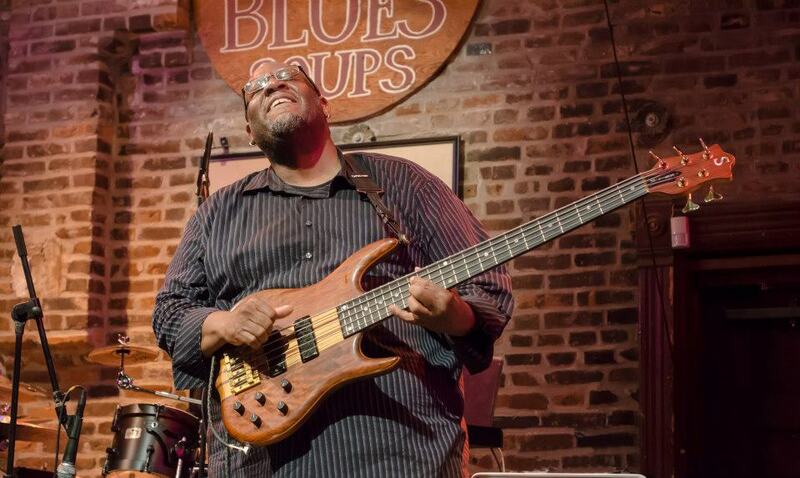 It’s safe to bet that in any discussion of local music in the area of St. Louis, Missouri it would be almost impossible not to mention the bass work of John King. A native of East St. Louis, Illinois his playing has grown and matured to make him a standout amongst his peers. With an uncanny ability to perform and emulate different styles of music he also plays with a gift of rich musical interpretation. King brings to the music creativity, soul, spirit, and skill. With some background and training on the upright bass, King feels his electric bass playing is often more suited for the majority of his gigging situations. He draws his influences from a recent, as well as earlier catalog of bass greats, and other musicians too numerous to name here. He has shared the stage with some of the best local talent and national artists’ Ali Woodson and Theo Peoples of the Temptations, Ben Tankard, Barbara Carr, David Garfield, David Peaston, Russel Gunn, Keon Harold, Ramsey Lewis, Pat Liston of Mama’s Pride, Alex Ligertwood, Andre Delano, Lynn Fiddmont, Larry Coryell, Cyrus Chestnut, two time Grammy nominated singer/songwriter Terry Steele, and numerous others. John can be found around town performing with Rocky Mantia, Jim Stevens Grp, Tim Cunningham, and Anita Jackson. He currently performs with Denise Thimes, the dance band Boom and his instrumental group Good 4 The Soul.